William Sproule is the Assistant Executive Secretary-Treasurer of the Keystone + Mountain + Lakes Regional Council of Carpenters (KMLRCC). KMLRCC represents more than 40,000 members in Delaware, District of Columbia, Maryland, New Jersey, Pennsylvania, Virginia, West Virginia and 10 North Carolina counites. Our members come from many different trade groups, including: commercial/residential carpenters; heavy highway; piledrivers; floor-layers; mill cabinet; and tradeshow. William is the former President & Regional Manager of the Northeast Regional Council of Carpenters which was dissolved and merged into Keystone + Mountain + Lakes Regional Council of Carpenters on May 30, 2018. As Assistant Executive Secretary-Treasurer of KMLRCC William’s duties include assisting the Council’s Executive Secretary-Treasurer with the development of the organization’s policies and procedures; overseeing all of the day-to-day operations for the Council’s local unions in New Jersey as well as in Philadelphia, Delaware, Maryland, Virginia and Washington, DC developing Collective Bargaining agreements; and organizing and expanding work opportunities for union membership. William worked his way up through the ranks as an apprentice carpenter in the former Atlantic City Local 623 in 1989 and had the opportunity to be a part of building a large majority of the casino and infrastructure projects in Atlantic City including: Bally’s, Caesars, Harrahs and the Taj Mahal. His most notable work in the City includes the development of the $330 million-dollar Brigantine Tunnel Connector, where he served as Shop Steward for 90 carpenters. William was hired by the organization in 1999 as a Council Representative. Since then, he has worked his way into mid-level leadership positions and served on his local’s Executive Board. In 2008, William was promoted to Organizing Director and in 2011 New Jersey Regional Manager. During his time with the organization, he has helped to oversee and facilitate two large mergers of the Empire State Council and Metropolitan Regional Council into the Northeast Regional Council of Carpenters. William was most recently promoted to Assistant Executive Secretary-Treasurer of the KMLRCC. William serves on the following Boards and Committees: KMLRCC Executive Board; KMLRCC Scholarship Committee; Trustee on the Northeast Carpenters Health and Welfare Fund; Trustee to the NCF Executive Finance Committee; Trustee to the Mid-Atlantic Carpenters Fund; Trustee to the Mid-Atlantic Carpenters Training Center; Trustee to the Philadelphia & Vicinity Joint Apprenticeship Training Fund; Trustee to the Philadelphia and Vicinity Funds and Co-Chairman of the Atlantic County Chapter of the Alliance for Action. He also serves on the William J. Hughes Center for Public Policy Steering Committee and is a New Jersey Energy Coalition Board Member. 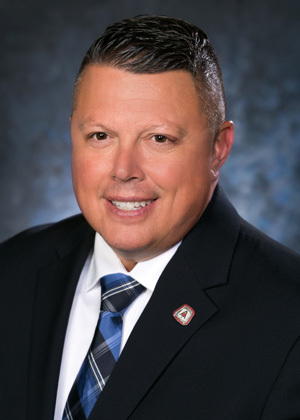 Sproule serves as a Board Member on the NJ Building Authority, serving his third term, is the Vice President of the NJ State Building & Construction Trades Council and is also a member of the New Jersey Gaming Commission. Sproule has also helped to raise money for the Special Olympics, South Jersey Cancer Fund and Brendan Borek High Tides Memorial Fund. William has also been involved in coaching baseball and softball as well as numerous volunteer projects over the years. In 2010, he and a large group of union carpenters – along with Vietnam Veterans of America Post 955, American Legion Post 184 and the City of Wildwood – helped to construct the replica of the Vietnam Memorial Wall in Wildwood, New Jersey. The monument, which is one-third of the size of the official Memorial in Washington D.C., is constructed of reinforced concrete and laminated with black granite panels. It displays the names of more than 58,000 service members killed in the Vietnam War. One of those panels bears the name of First LT William C. Sproule, Jr., William’s father, who was a rifle platoon leader in the Army’s 173 Airborne Brigade and was killed in action on May 10, 1968 and was posthumously awarded the Distinguished Service Cross. William’s hobbies include spending time with his family, attending his children’s sports events, exercise and weight training, fishing, guitar, carpentry, golf, surfing, and reading about topics such as History, Labor Law, Politics and current local, national and world affairs. He is married and resides in Smithville with his wife, Amy, and two children, Emily and Billy.